Above: This Portland area basement contains a kitchenette for light food prep activities and access to a backyard BBQ. Thinking of turning that musty, unused basement into a new living room, entertainment room or accessory dwelling unit (ADU)? Before you start dreaming of a new home bar, wide-screen TV and La-Z-Boy, you need to ask yourself a few questions: How high is it from the concrete floor to the bottom of the floor joists? What’s your head height? Is there an exterior entrance? What’s the condition of the stairs? Does your basement meet the legal requirements for living space? Once you’ve got those answers in hand, call Neil Kelly. 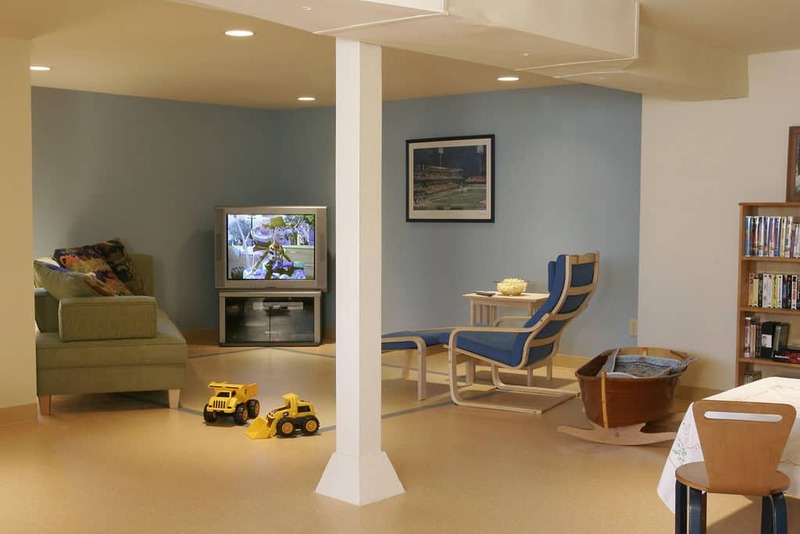 Here’s what you can expect when you work with us on a finished basement. Neil Kelly breaks down basement remodels into three categories: cosmetic non-structural, new floor plan, or a new foundation — including raising the house, excavating, then pouring a new foundation. 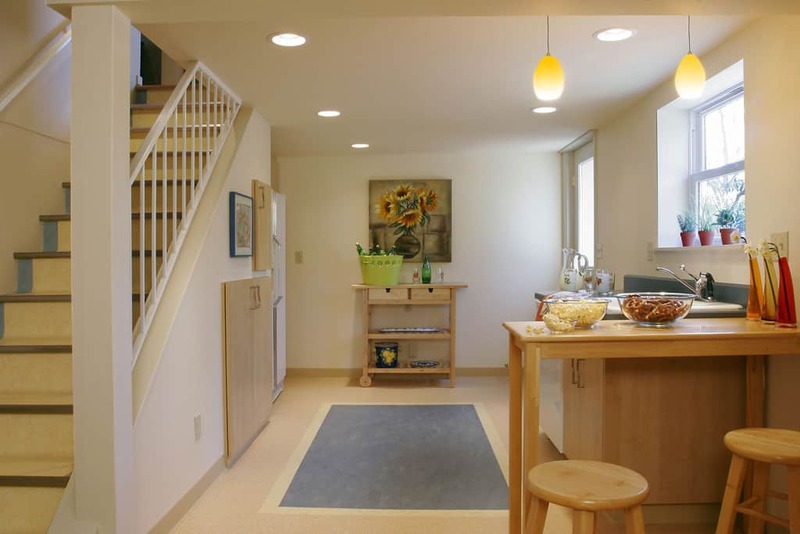 Above: The basement also includes versatile space for a growing family. If your basement vision is a bit more involved, you can go further by changing the floor plan to add a living space like a bedroom and bathroom. Structural options include additions like an egress window, frame walls or expanded plumbing. An accessory dwelling unit (ADU) can be a flexible space, from a bedroom and living area for friends and visitors, to a separate unit for rental income. “Building a separate unit in the basement would fall into the “new floor plan” category — but it’s important to make sure the plan meets the legal requirements of an ADU, like the minimum head height and routes of egress,” says Sipes. Above: House lift prior to excavation and new foundation pour. The third category for your basement renovation is starting from scratch. Often, these projects stem from the current basement not meeting the legal requirements for the space. “If the ceiling is too low, that’s usually the first indicator that you might need a new foundation,” says Sipes. Another major factor is the condition of the current foundation. If it’s in disrepair or structurally unsound, you’ll probably need a new foundation before even thinking of that new game room. Typically, these foundations are found in homes built in the 20s and 30s. “They didn’t have the science of concrete mixing down, so we see a lot of houses where the concrete at this point, nearly a hundred years later, is starting to fail,” says Sipes. If that’s the case with your basement, your new foundation will offer lots of advantages. “It’s often worth it for people to buy an older home, lift it up, excavate the foundation, and pour a brand new one,” says Sipes. 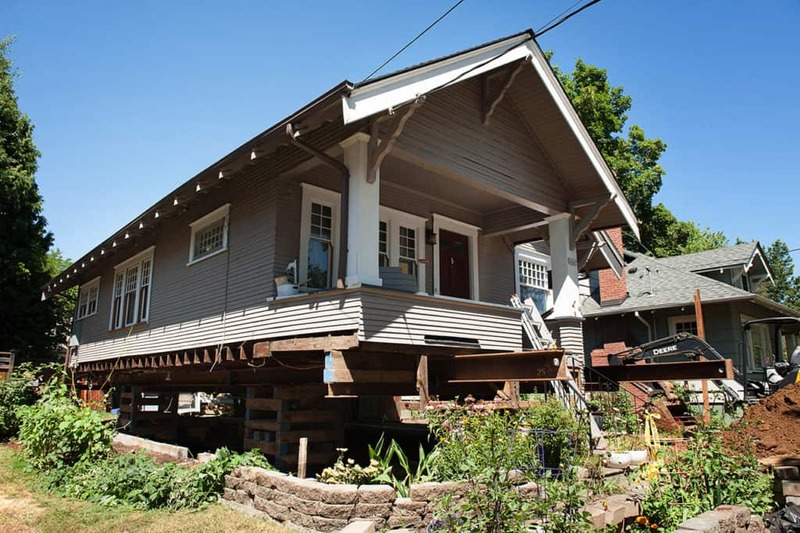 The four big advantages of a new foundation: full eight-foot ceilings, it’s earthquake safe and up to current seismic code, you can waterproof it on the exterior — and you get a lot of additional space. “If you’re adding a new basement you’re basically increasing your home’s livable space by 50 percent,” adds Sipes. Need a simple basement upgrade or a whole new living space? Neil Kelly can help you envision your new space, whether that’s an ADU, new foundation, or simple fixes. Get in touch with us!